Lessons are a great way to learn a new skill, brush up on old skills and move up to the next level. For those that already drive, our instructors can help you to refine the details or resolve problems. You may want to go up a gear and master the obstacles or improve your ringcraft. Perhaps you want to try driving a pair? Attempt a tandem? Or even drive a team? Using our horses or bringing your own horse to Grayswood or a combination of both types of lesson we can help you achieve your goals. For those new to driving we will teach you from the ground up to make sure that you have solid foundations for your driving career. Like all good learner vehicles, our horses are fitted with “dual control reins” so if you have a wobbly moment we can smooth things out and get you back on track. 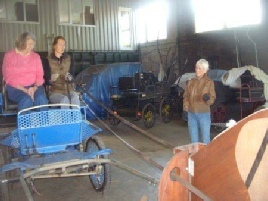 During the first part of the session students will be taught how to prepare their horse, harness up and put to the vehicle. We cover all aspects of safety, horse comfort and discuss any varying methods. holding your reins so before you get to the real horse we show you how to steer and stop using our model “Woody”. 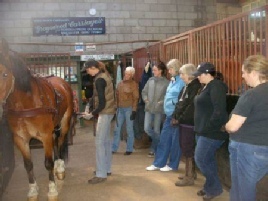 As the session draws to a close you will be shown how to unhitch and unharness your horse and attend to their needs. 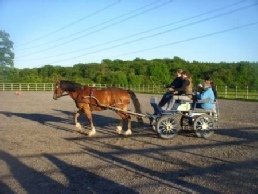 Prices start from £40 for an hour’s individual lesson with one of our horses, an instructor and a groom. Please contact us to discuss what would suit you best. Group lessons are great fun, when everyone is kept involved and busy. 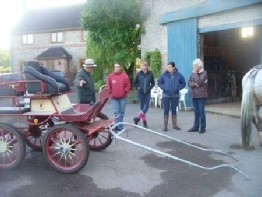 The larger the group and duration of the session, the more turnouts (staff, horses & vehicles) we will need to use. 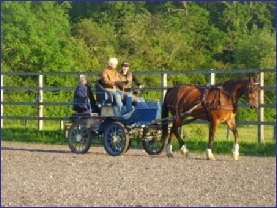 Below we have made suggestions for group sessions to make sure everyone gets time in the driving seat and the horses are kept comfortable. We can easily adjust the duration of the sessions and the number of turnouts to make your event exactly what you want. We are able to cater for larger groups, please contact us to discuss ideas. Lessons are also a great “have a go” social event. We are able to host part or full day events. Catering & refreshments can be provided by prior arrangement.